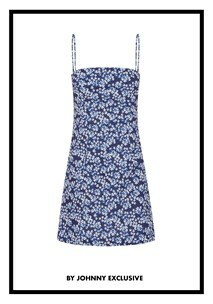 A SIMPLE MINI A TWIST, THIS BY JOHNNY SHIFT DRESS IS CANVASED BY A BOLD FLORAL PRINT, CREATING A FEMININE AESTHETIC. CUTTING LOW AND STRAIGHT IN THE NECK, THIS MINI DRESS FITS THE FORM WITH FLATTERING EASE. FITTING FIRM ON THE BODY THIS EFFORTLESS DESIGN SITS AT A MINI LENGTH. THE JASMINE MINI SHIFT DRESS IS MADE FROM FUSED PRINTED BUBBLE FABRIC AND IS FULLY LINED. THIS DRESS POSSESSES A CENTRE BACK ZIP.